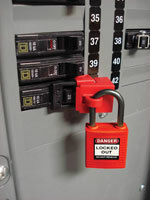 The Compact Safety Padlock is extremely compact and lightweight. This padlock is the smallest lock on the market, with a 3/16-inch shackle diameter and weight of only 0.7 ounces. The padlock also comes with a five-pin cylinder.